No Falcon Doors. No crazy gimmicks like Bioweapon Defense Mode. No pickup truck. No zany new features to spread to other cars. Tonight’s reveal of the Tesla Model Y crossover was, compared to many of the automaker’s previous dazzling Apple-like presentations, pretty boring. It felt normal—as does the car. The Model Y is a taller Model 3 with a hatch, as expected. That’s pretty much it. Inside and out, nothing feels really new here. It’s a crossover in the same way that most crossovers are lifted hatchbacks, really. It’s not some wild, radical, complicated experiment the way the Model X was. It’s as straightforward a product as Tesla has done yet. And that says a lot about Tesla’s trajectory, and where it needs to be right now. Despite setbacks, quality issues, production troubles and its CEO’s penchants for innovation and self-sabotage in equal measure, it’s rapidly transforming from boutique, niche brand to a mainstream car company—especially as every other automaker goes big on electricity too. Tesla kicked off the electric revolution and now every other car company seeks to do the same thing. There’s still crazy stuff coming down the line, in theory—the Roadster and a pickup truck are still said to be in the cards, and the Semi even made an appearance onstage tonight. But the Model Y exists to do what most crossovers are supposed to do right now—pay the bills. Make money. Underwrite R&D costs. And take on the coming wave of electric crossover competitors from Audi, BMW, Mercedes, Aston Martin and pretty much every other luxury nameplate. It’s a mainstream, mass-volume car, even more than its sedan sibling is. The Model Y isn’t here to rewrite the playbook. It’s here to hold the line. Probably the biggest surprise tonight is that it will have an optional third row of seats to fit seven. But that’s pretty tame from the company that gave us Ludicrous Mode. That isn’t to say the specs aren’t impressive, at least on paper. 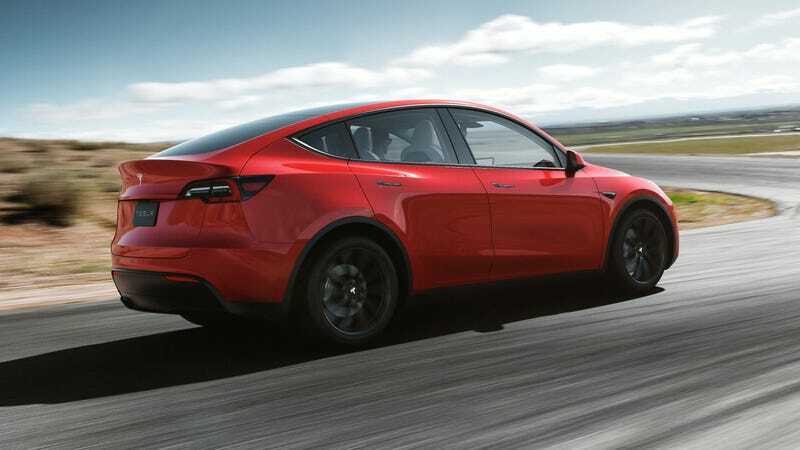 With a range of up to 300 miles, a starting price allegedly and eventually around $39,000 and a zero to 60 mph time of 3.5 seconds for the top Performance variant, it’s definitely a solid, fast and desirable electric crossover. If Tesla can deliver on all those things it should be poised to strike well at the coming competition. One thing worth noting, as with everything Tesla, is the timing. It’s hard to believe it was almost three years ago we met the Model 3 for the first time, but deliveries didn’t really happen in force until last year. The long-promised $35,000 Model 3 took even longer and came with some serious compromises. And now with Model Y, we’re looking at deliveries in fall of next year at the earliest, and two years away for the base $39,000 standard range model. Most car companies get their cars on sale within a few months of a reveal, but Tesla’s still working to build its scale of production. It wants to build 2,000 Model Ys a week by next September. Given how difficult Model 3 production is and was, it may be safe to call that optimistic for now. Then again, the Model Y’s similarity with the Model 3 will probably help, and again, that’s the point here. Those of us waiting for some kind of big Muskian surprise this evening—and I count myself among them—were left a bit disappointed. But Musk did say he expects the Model Y to sell more than the Models S, 3 and X combined. With the crossover boom not going anywhere, that’s probably true, provided Tesla can pull off its ambitious production plans. But get to know the Model Y for what it is: evolution, not revolution, and hopefully a lucrative one.